Atomic Force Microscopy has become a valuable tool not only for visualization but also for performing accurate measurements on the nanometer and micrometer scale. In order to make the most of their measurement capabilities, AFM systems need to be properly calibrated. HS-500MG is one of the height standards introduced by BudgetSensors as a response to the increased demand for affordable high-quality AFM calibration standards. The HS-500MG features silicon fioxide structure arrays on a 5x5mm silicon chip. The fabrication process guarantees excellent uniformity of the structures across the chip. This in turn ensures easy and reliable Z-axis calibration of your AFM system. The calibration area is situated in the center of the chip. It is easy to find with the AFM optical system. The structure step height is in the range of 500nm. The exact value for each chip is indicated on the box label. Arrays of structures with different shape and pitch are integrated on the chip. The larger square (1x1mm) contains square pillars and holes with a 10µm pitch. 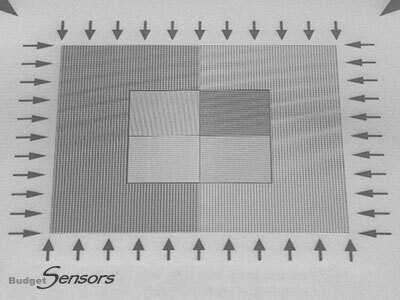 The smaller square (500x500µm) contains circular pillars and holes as well as lines in the X- and Y-direction with a 5µm pitch. Aside from Z-axis calibration, this design also allows X- and Y-axis calibration for bigger scanners (40-100µm range). What is more, the structure symmetry makes it possible to calibrate your AFM system without the need to rotate and realign the sample in-between X- and Y-axis calibration. The HS-500MG chip is glued onto a 12mm metal disc using a high-quality electrically-conductive epoxy resin and it is ready for use as shipped. It is also available unmounted (HS-500MG-UM).